Backing up WeChat regularly is the best way to avoid data loss. It is convenient to backup using iCloud. However, iCloud storage is limited and you have to purchase more storage if it is over 5GB. In addition, we cannot backup only WeChat to iCloud. Instead we have to back up the whole iPhone to iCloud. This is time consuming. 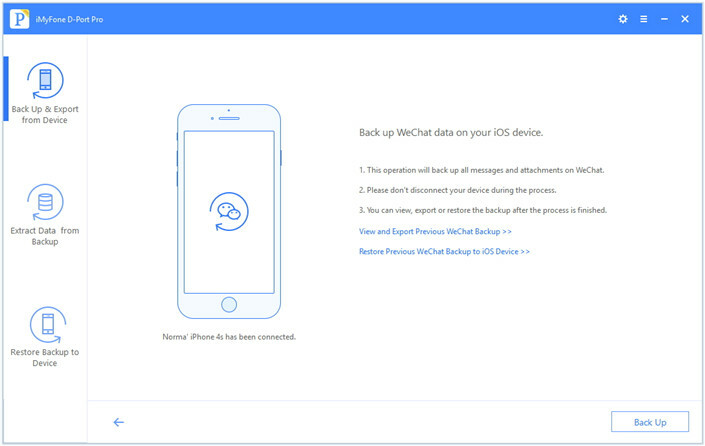 Therefore, you might be looking for a way to backup WeChat without iCloud. 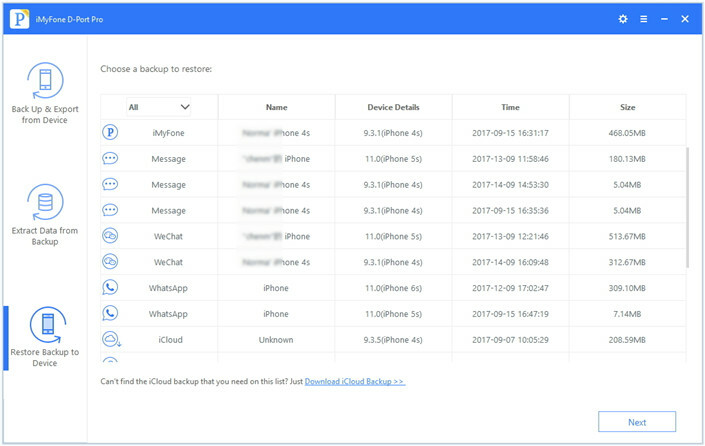 For this reason, we are going to introduce 3 different and convenient methods which are totally free in this article to help you backup WeChat without iCloud. Go ahead and read further. At first launch the 'iTunes' software on your computer after downloading the newest version available. Now, connect your iPhone and computer using an USB cable. iTunes will take a while to detect your iPhone. After that tap on the iPhone icon from its main screen and then click the 'Summary' tab. Under the 'Summary' tab, go to 'Backups' and choose the 'This computer' option. Now, click 'Back Up Now' button to start the backup process. At the end of this process, iTunes will backup your WeChat into your computer along with all other device data. 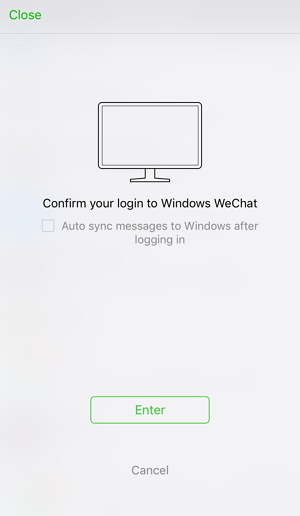 Next method with which you can backup WeChat to your computer is via WeChat Web for PC, available for both Windows and Mac Systems. 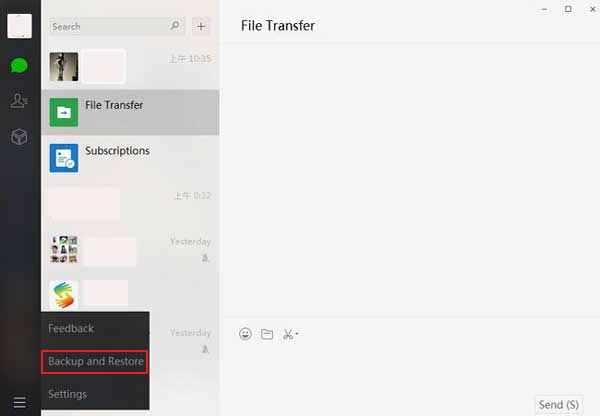 Using this software you can backup WeChat without iCloud (entire chat history) to your computer and restore it later whenever you need. First, download the computer specific (Mac or Windows) software on your computer and then follow the guide below. Step 1: First of all install the latest version of WeChat Web desktop software and launch it. Step 2: Now, you need to open WeChat on your iPhone and get into the 'Discover' section, then tap on 'Scan QR Code'. Now, scan the QR code shown on your 'WeChat Web for PC' screen and your iPhone will be connected wirelessly to the PC, for creating a backup. On your phone confirm the action. Step 3: Now, on the WeChat Web screen tap the 3 horizontal bars found on the bottom left corner. 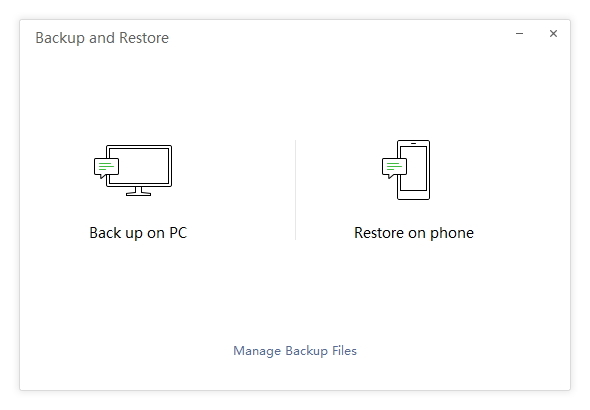 Select 'Backup & Restore'. Step 4: You will see a pop-up window, click 'Backup to Computer' and confirm the action on mobile. 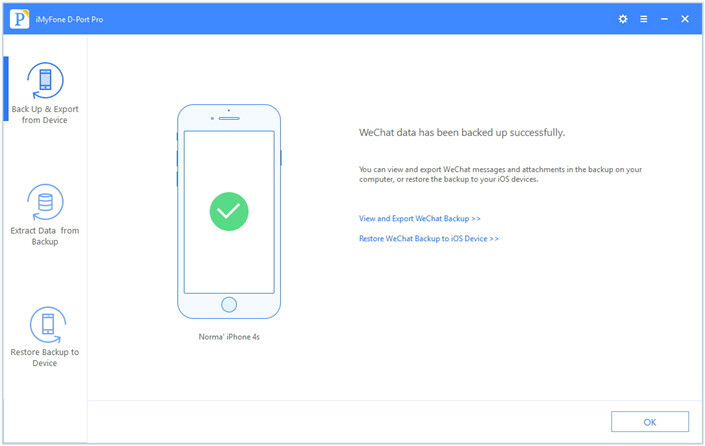 It will backup WeChat without iCloud and prompt you to confirm. Hit 'OK' when process is over. If you want to backup WeChat using a more flexible tool, then you can opt for iMyFone D-Port Pro. 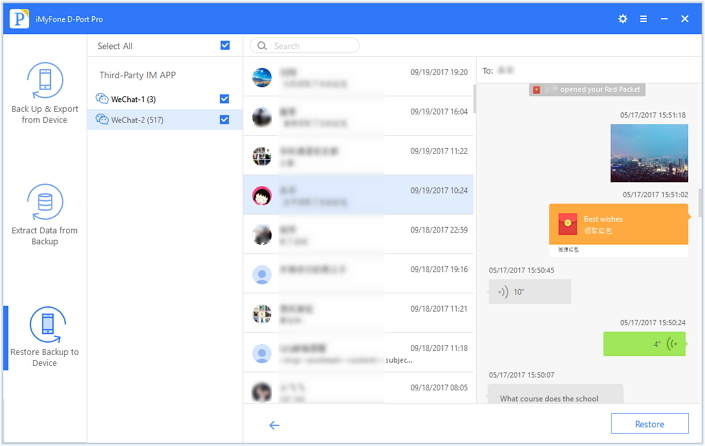 With this software you can selectively backup WeChat as well as WhatsApp, messages without overwriting the old backup on your computer. Accordingly, these backup files can be restored to your iPhone without influencing the other data. 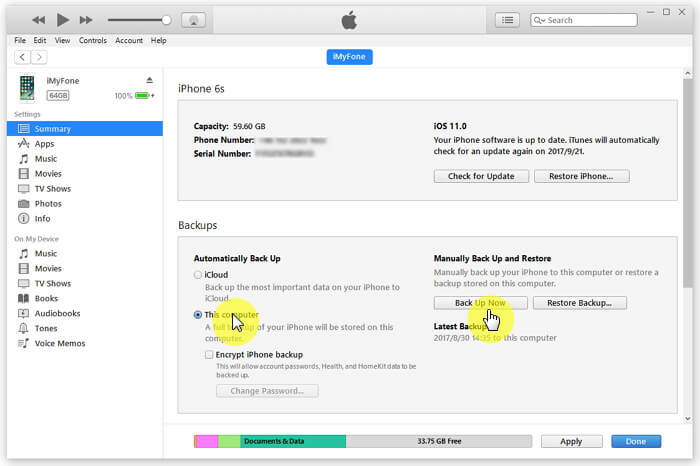 Moreover, it can also restore iCloud/iTunes/iMyFone backup selectively. This software supports the latest iOS version on both Windows and Mac systems. Step 1: Install and launch iMyFone D-Port Pro on your computer, and then connect your iPhone. From the left panel of the main screen, choose 'Back Up & Export from Device'. Step 2: Now, tap the 'Back Up WeChat' tab and navigate to the next screen. Here you have to click the 'Back Up' button to initiate the backup process. Step 3: Upon successful completion of the backup process, you will get an onscreen notification saying 'WeChat has been backed up successfully'. Click 'Ok' before disconnecting your device. 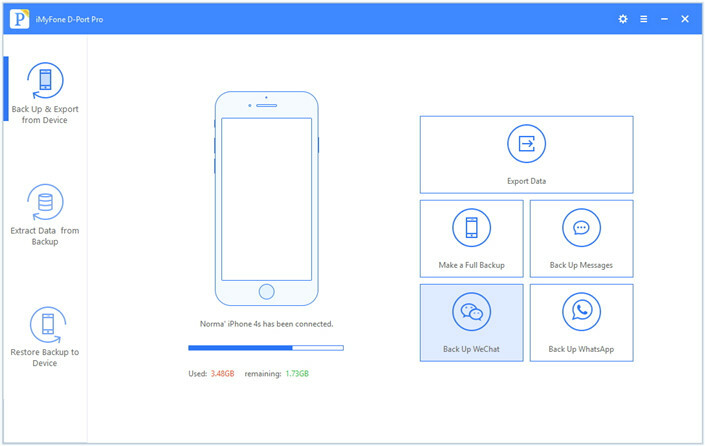 Now that you have taken a backup WeChat without using iCloud, you can restore it to another iPhone. This program allows you to restore only WeChat, WhatsApp, Messages to your iPhone. Follow the below mention guide for understanding the process in detail. Step 1: Launch the program and select 'Restore Backup to Device' from the left panel of the main window. Connect your iPhone to the computer and select the backup you've just make or any other desired backup file from the list shown there and tap 'Next'. Step 2: Now, if you've chosen the same backup that you've just made, simply hit 'Next' from the upcoming screen. If you've chosen other backup files such as iTunes or iCloud backup, then the tool will ask you to either 'Restore Partial Backup' or 'Restore Full Backup', choose the former one and click 'Next'. Then choose WeChat from the data types and tap on 'Next' again. 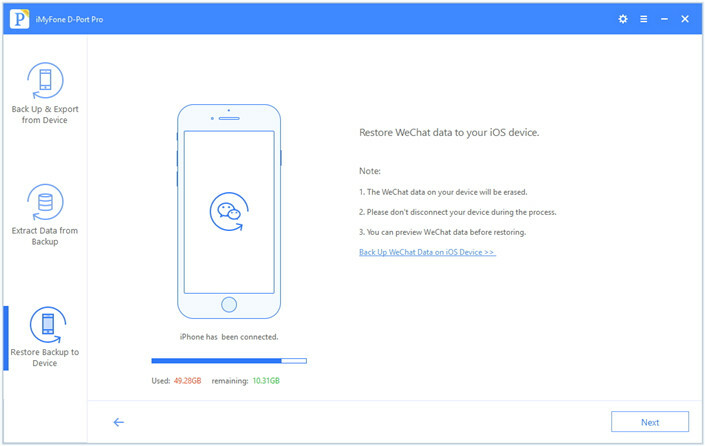 In this way, you will be able to restore only WeChat data from iTunes or iCloud backup. Step 3: The tool will then scan the backup file and load the 'WeChat' data on the next screen for your preview. Tap 'Restore' to confirm the initiating the restore process and click 'Done' upon completion.